Give them a personalized gift that will allow them to enjoy some fun in the sun this summer! This Embroidered Backpack Cooler is so versatile and handy. 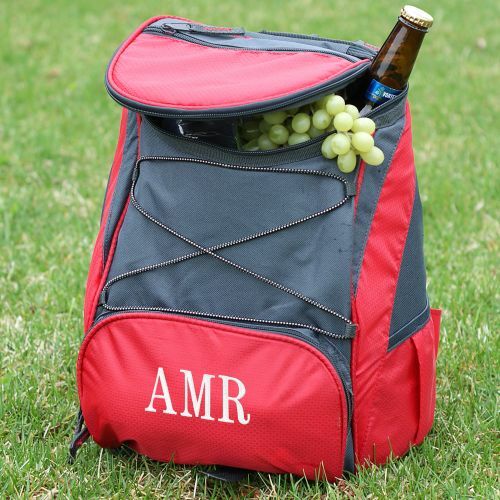 With a fully-insulated interior liner that's also water-resistant, you can use it as a food and beverage tote or as an all-around activity tote. With a variety of expandable pockets and front-mounted stretch cord, the Backpack Cooler can accommodate and store items beyond its visual confines. It's compact, comfortable and accommodating, the perfect all-around backpack cooler for people on the go! This backpack cooler measures 11" x 7" x 12.5" and holds the capacity of 20 cans. Free personalization of any name or three initials is included in white thread. Great for personalized Father's Day gifts, groomsmen gifts and personalized bbq gifts. Nice size bag for every day use or for a day out and about. Ample space for non-perishable items, too, such as a small wallet, phone, medicine, tissues since there are two zippered compartments in addition to the large main opening. Plus, there are outside side pockets for water bottles or other items. Bungee cords will hold a small towel or visor. What a great idea. I bought one for all my kids. The embroidering on it is very nice. Good quality. 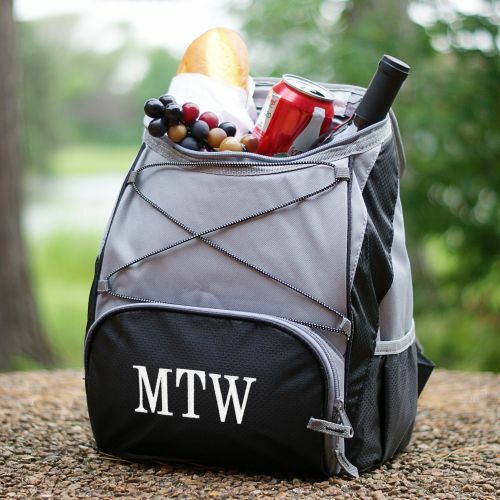 Additional Details Our backpack cooler is an excellent summer concert, picnic or personalized groomsmen gift idea. Perfect for summer fun and celebrations, your friends or family will love having a cooler for excursions with their friends. Our Embroidered Deluxe Picnic Cooler is another gift option they might enjoy.